This dip is always a huge hit. It is like eating monster cookie dough in dip form. Once you start, it's hard to stop! 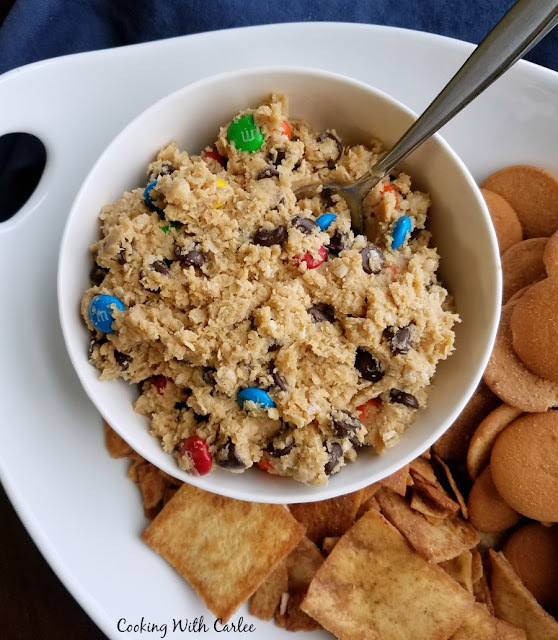 Monster cookie dip is a super fun snack for all of the monster cookie lovers in your life. It is kind of like getting permission to eat cookie dough. Plus you can use fun dippers to do it! Put this on your must make list for your next get together. My husband and I always host our friends and family for big football games. Sometimes its just a random Sunday and our Steelers are playing, or a fun playoff game. We always have a spread of food and people come and go and grab a bite. For the biggest game of the season, we do it even bigger. We set up two TVs in the living room and another one in the dining room. The food spread gets bigger too! 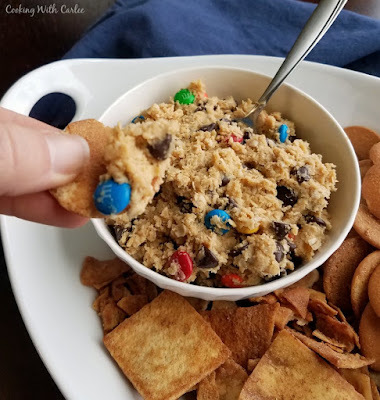 MiMi made this monster cookie dip a few years back and it was a hit. Carlee and Matt hosted a Big Game Party and invited family and friends. As with most parties I got busy thinking about what I could make to bring. I got this idea from a food blog titled The Girl Who Ate Everything. I pretty much followed what she did, but I added a little extra brown sugar and vanilla knowing that's the way my family would like it. Carlee had so many wonderful things to eat that everybody was pretty full by the time we put the sweets out. Most of her guests were curious so they put a little on their plate so they could try it. I happened to be sitting in the dining room where the food was being served. It got to be funny watching those that thought they would just want a little taste come back and fill their plates. This was quick and easy to make and something that we had never tried before, but will certainly enjoy again! We really love serving sweet dips and cheese balls at parties. They are easier to serve than fancy baked desserts plus they are easier for people to munch on without having to commit to a big piece. The fact that they can almost always be made ahead is a big bonus as well! If you are looking for more fun sweet dips, we have some more ideas for you! The red velvet cheese ball is always a fun one to serve. Or there is always peanut butter and yogurt dip. We love it on fruit, but it would also be great on any of these dippers! Do you have a favorite sweet dip? Mix together the cream cheese, butter and peanut butter. Add the powdered sugar, brown sugar and vanilla and mix well. Stir in the oats, M&M's and chocolate chips. Cover and refrigerate for about a half hour before you are ready to serve. Remove from the refrigerator and let it soften a bit, then serve with your favorite dippers. Let me warn you, Andrea... this is addictive! This entire bowl was done for by the end of the night. I am glad we had a crowd over otherwise I might have drained it myself! I hope you try it Ali, you are sure to love it! I need this ASAP! This looks like the most amazing thing ever! It lives up to expectations too! I hope you love it! Now this is a great idea! I love anything to do with cookie dough-- so this looks dreamy to me! Me too! 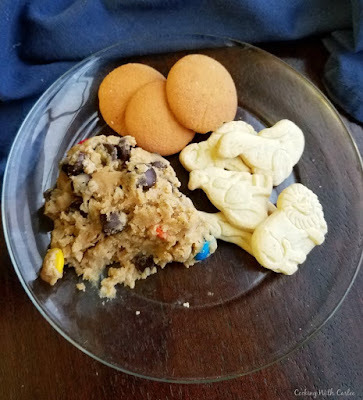 Cookie dough is one of my favorite guilty pleasures. And this has oatmeal in it, so it's healthy too right? This sounds amazing! Wow...I bet I could eat the whole bowl! Me too! We'll each have to make our own batch then so we don't have to share! I am making this Saturday for sure! My son and I will tear it up! Thanks for sharing at Inspiration Thursday. Have a great weekend! I hope he loves it as much as we did! I could live on this kind of stuff! Have a wonderful weekend and thanks for the party. Yummy! I would have to add the extra brown sugar and vanilla too. Thanks for bringing this to the Country Fair! It is soooo good that way! Thanks for hosting! It is soo good, thanks! I would totally hide this and save it for yourself! Thanks, Michele! It is soooo good and hard to stay out of once you start! This looks fun Carlee - and addictive! I just Yummed it! It is, beware! Thanks, Susan! Dips are my secret comfort food. Saving this one for myself. Thank you for sharing this delicious recipe at The Recipe Sharing Pin and Yum Party! I hope to see you next week. Pinned and Yummed. I love dips too. I don't make them too often because I find it hard to stop once I start and that is definitely a problem with this one! Thank you so much! YUM! You need to tell Mimi that I am pinning this recipe cuz I need to make it! I am sure she appreciates it. I kept hearing her giggle as people who just wanted to try it came back for more (and more!) It was so darn good. Next time I want to try apple slice dippers, then it would be health food! Yum! This looks SOOO delicious! Thanks for sharing at Funtastic Friday! Thank you, it was ridiculously good! This is just genius Carlee! Instead of eating it right out of the carton, this makes eating cookie dough legit :). Thanks for sharing at You Link It, We Make It. Pinning! Thank you so much! I love cookie dough, so this was an instant hit with me. I hope you enjoy it! It really is, so beware! This could be very dangerous for me! Thanks for linking up to the Country Fair Blog Party Carlee! It is very dangerous (but totally worth it!) Thanks so much for hosting!